Climate justice or a climate treaty—you can’t have both. 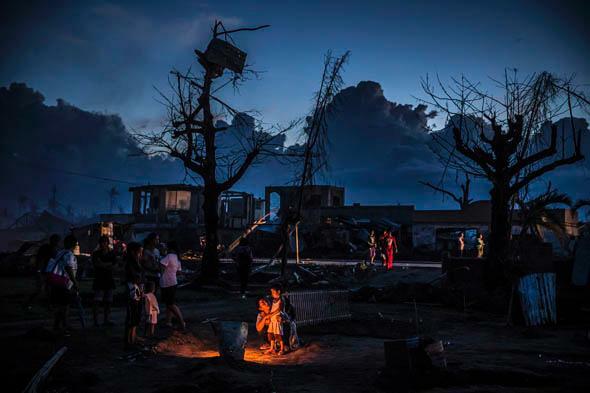 A family gathers around the grave of a relative killed when Typhoon Haiyan struck their home, on Nov. 18, 2013, in Leyte, Philippines. How culpable are top greenhouse gas emitters, like China and the United States, in the typhoon? In the wake of the devastation to the Philippines caused by Typhoon Haiyan, a long-standing claim for “climate justice” has re-emerged with new force. Countries vulnerable to more devastation, as temperatures rise, want rich countries that have benefited from industry that produces greenhouse gas emissions to pay them reparations. Advocates argue that climate change negotiations, currently being held in Warsaw, should aim for a climate treaty that forces the climate wrongdoers to pay the climate victims. This would mean countries like Bangladesh, the Philippines, and Kenya getting money from countries like the United States so that they don’t alone bear the cost of a global carbon dioxide overload that they did little to cause. It sounds great—but such an approach would doom the prospects of a climate treaty, and the argument for it doesn’t add up. Climate justice trades on a powerful moral intuition, embodied long ago in Aristotle’s principle of corrective justice: A person who wrongfully harms another person owes compensation to the victim. The greenhouse gases in the atmosphere today are mostly the result of fossil fuel consumption that goes back more than a century, most of which took place in the United States and Europe. These countries are thus disproportionately responsible for the harm being visited on poor countries. But there is less to this argument than meets the eye. The first thing to be clear about is that blame for Typhoon Haiyan cannot be assigned to any particular country. There is no way to show that the typhoon would not have occurred but for emissions of greenhouse gases. It is not even clear that emissions increase the likelihood of typhoons. The strongest point with scientific backing is that over the long term, countries will generally suffer climate-related harms as a result of greenhouse gas emissions, and poor countries will suffer the most. Advocates for climate reparations argue that Western countries enriched themselves for decades while disregarding the well-being of people living elsewhere. But the industrial revolution also enriched non-Western countries. Filipinos, for example, have gained immensely—in terms of life expectancy, health, education, and material comforts—relative to a world in which fossil fuels were never burned. If rich countries must pay for harm caused by industrialization, then they will be able to argue that the benefits poor countries enjoy as a result of industrialization should be subtracted from the climate-related losses. Maybe, according to this view, on balance the poor countries should pay the rich. Of course, poor countries could add charges for colonialism, the slave trade, and the Crusades. To state the principle is to show why this won’t work: Climate justice will turn into a world-historical accounting of all the benefits and harms that all countries have imposed on all others—a futile debate if there ever was one. Another problem: Many of the countries emitting high levels of greenhouse gas are themselves poor. Although the United States is currently the second-worst yearly emitter, others at the top include China, Indonesia, Brazil, India, and Iran. If culpability rests on per capita rather than absolute emissions, then the worst countries include Montenegro, Equatorial Guinea, and Belize. Or if culpability is calculated in terms of emissions relative to the size of the economy, then the worst countries include the Central African Republic, Burundi, and Zambia. (My source is the World Resources Institute’s Climate Data Explorer.) A climate treaty that aims for corrective justice would thus burden a lot of poor countries. And even if you move past all those objections, you still need to establish that the rich countries acted culpably by emitting greenhouse gases. The issue here is that most emissions in the United States took place before the 1990s, when few Americans knew about, or understood, the dangers of climate change. Even since then, it is difficult to argue that Americans act in a blameworthy fashion by heating their homes and firing up their laptops, which is what everyone does albeit usually to lesser (as well as varying) degrees. We might blame ourselves for failing to elect governments that unilaterally cut emissions, but our governments have justifiably held out for other countries like China to agree to do their share. After all, unilateral emission cuts will do little to solve the problem. One of the most challenging features of the climate change problem is the time lag between emission and harm. It was our ancestors who emitted much of the stock of greenhouse gases, and most of the harm they caused will not take place until additional decades have passed. If a climate treaty compelled monetary transfers from historic wrongdoers to victim countries today, these transfers would be to people who have not been harmed from people who have not harmed them. Yet the people who will live in the Philippines, India, and Kenya decades from now will be much richer than the people who live in those countries today. Why should a climate treaty compensate wealthy people in the future who will be somewhat less wealthy than they would have been if greenhouse gas emissions had taken place at lower levels? Treaties are deals that countries enter into in order to advance their interests. A climate treaty is possible only if it makes all countries better off than the status quo. China must believe that it loses more from future climate damage than it loses from the increase in the price of energy that would result from greenhouse gas emission limits. So must the United States, Russia, Bangladesh, and Kenya. Because all countries weigh the benefits and costs differently, they all support different emission limits. A feasible treaty must walk an extraordinarily fine line, leaving no room for righting the wrongs of history. This is not to say that the rich countries should ignore the moral claims of poor countries. But these claims should be based on their poverty, not on a historical accounting of the costs and benefits of the Industrial Revolution, colonialism, and the Crusades. Aid and other forms of assistance—like U.S. aid to the victims of Typhoon Haiyan, based on humanitarian considerations rather than corrective justice—already take place outside any climate treaty. And that is where they should stay. A feasible treaty is not the same as a treaty based on reparations or redistribution. You can have justice or you can have a climate treaty. Not both.